See simulation images at bottom. 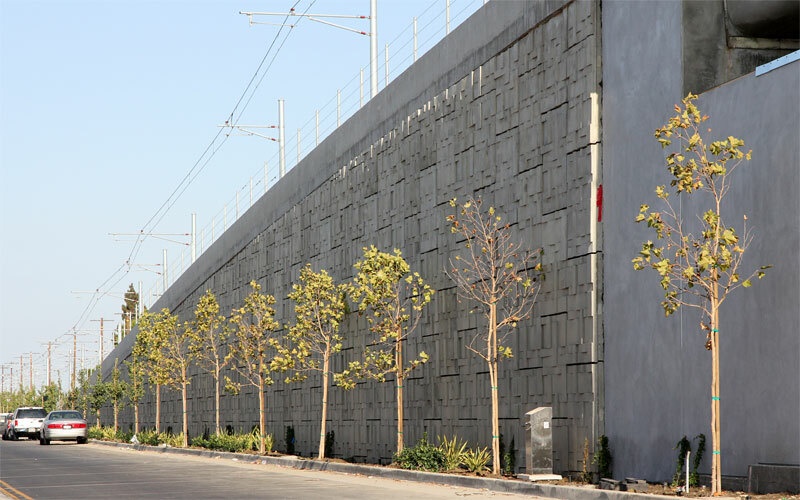 12/3/11 — Landscaping on the south side of the sound wall west of La Brea. 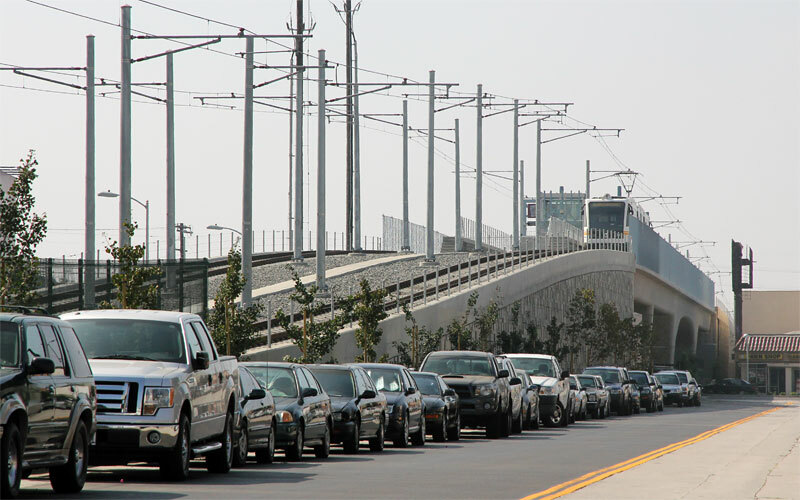 9/28/11 — Test train crosses the La Brea bridge. 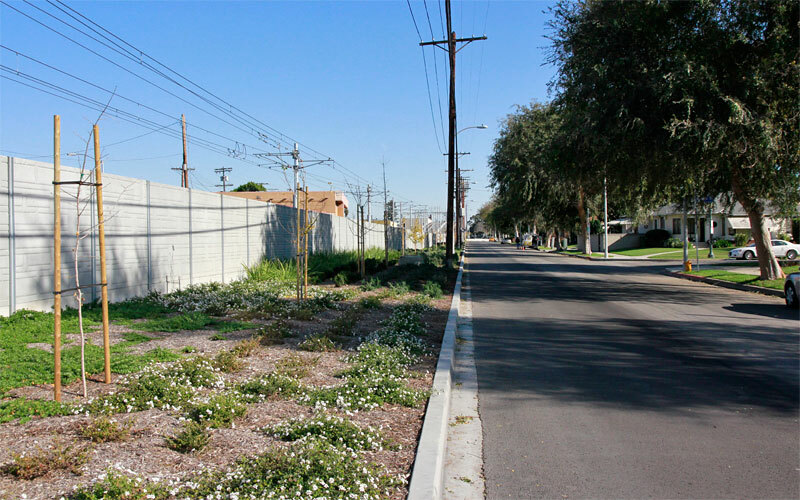 7/27/11 — Paving is complete at the La Brea station, and taller London plane trees (a variety of sycamore), followed by the more frequent ginkgo billobas, soften the retaining wall to the east. 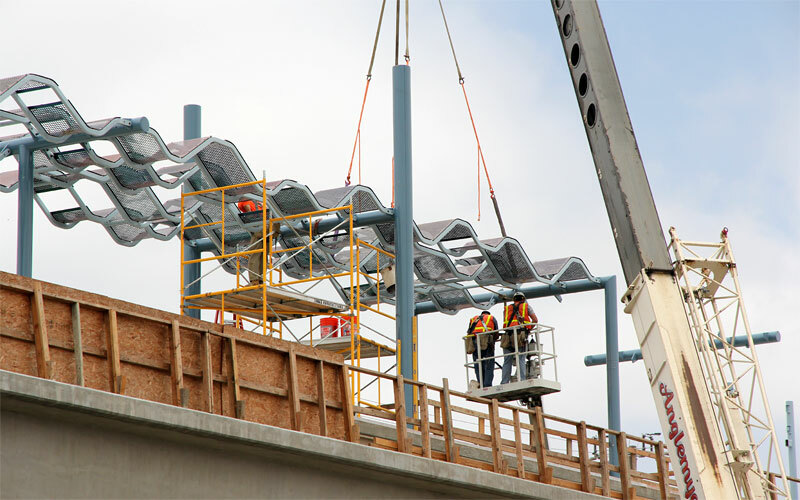 1/21/11 — All catenary wires are complete across the La Bridge. Compare the view above with previous photos below on 2/18/10, 11/20/09, 10/6/09, and the simulation image. 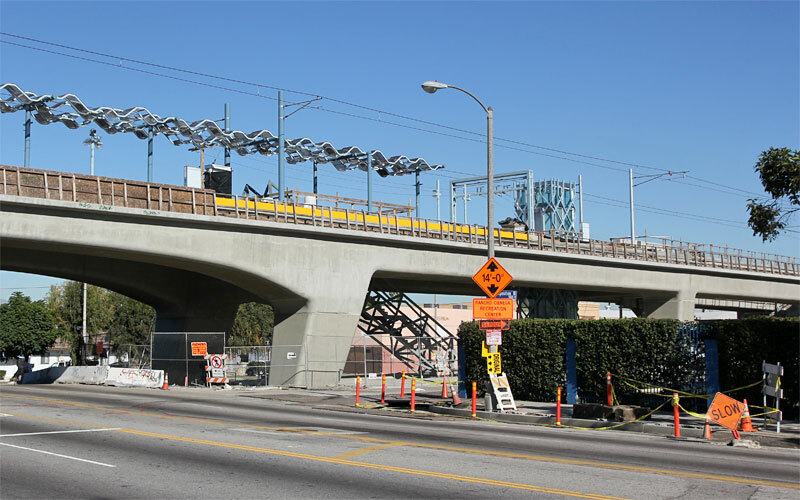 1/5/11 — Here's the La Brea station with the newly-installed messenger (upper) OCS wires and curb with the first part of repaving Exposition Blvd. 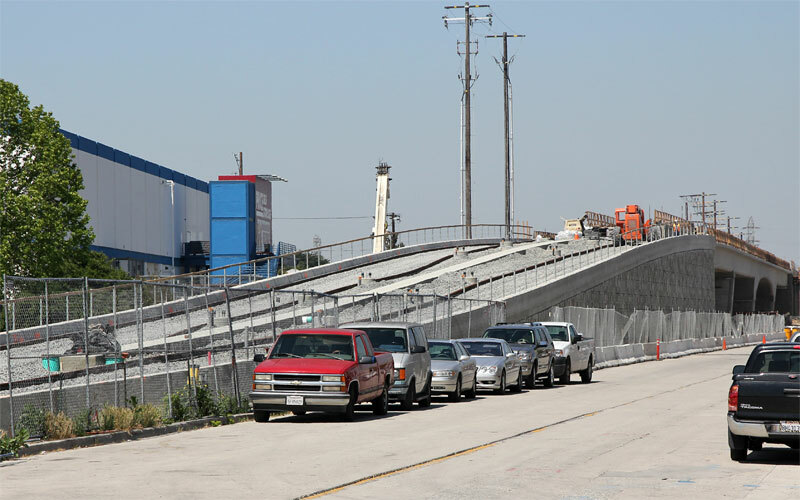 11/2/10 — The first stairway has finally appeared, on the west side of La Brea. 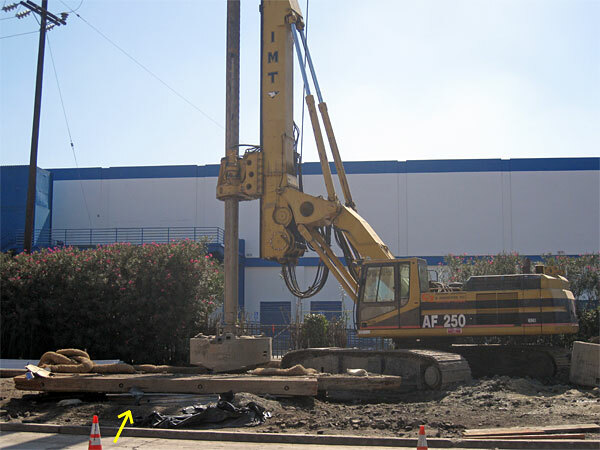 9/2/10 — You can see the hydraulic shaft under the eastern La Brea elevator. 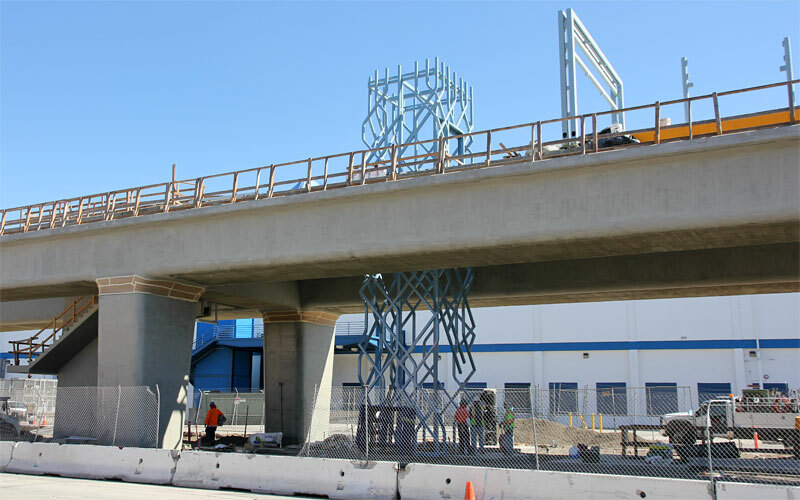 8/20/10 — The second elevator cage is in on the east side of La Brea. Also note the masking paper on the columns for spraying anti-graffiti coating. 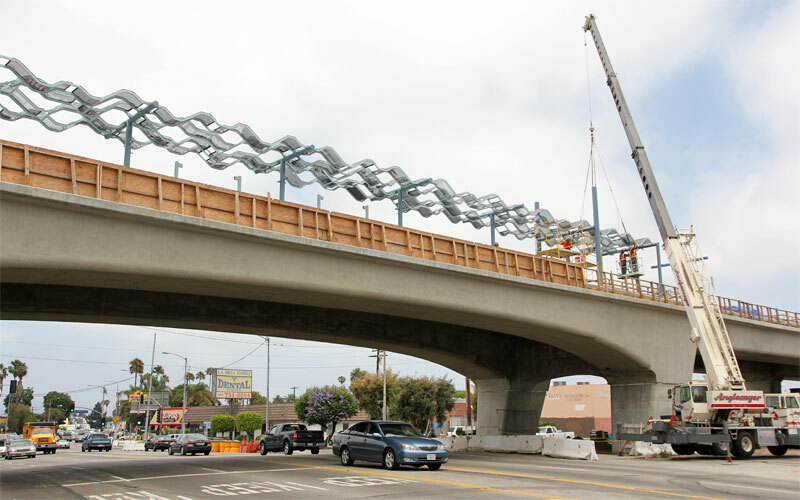 7/7/10 — The canopy is being installed over the La Brea bridge station. 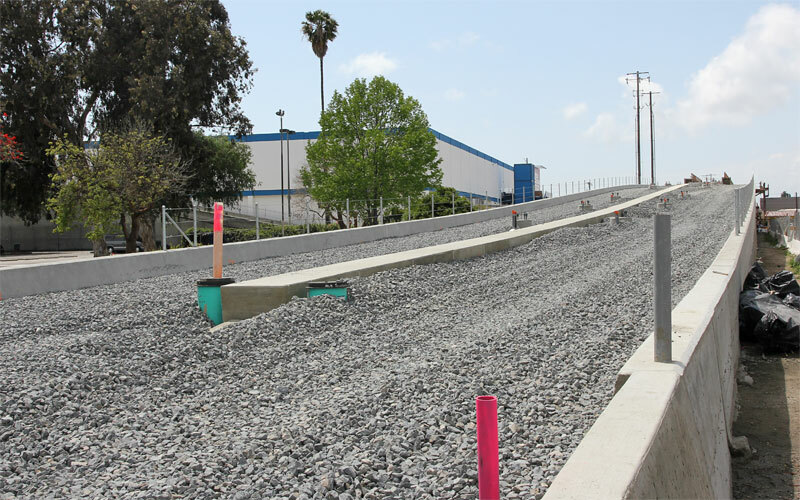 6/27/10 —Track is finished across the Hauser grade crossing. 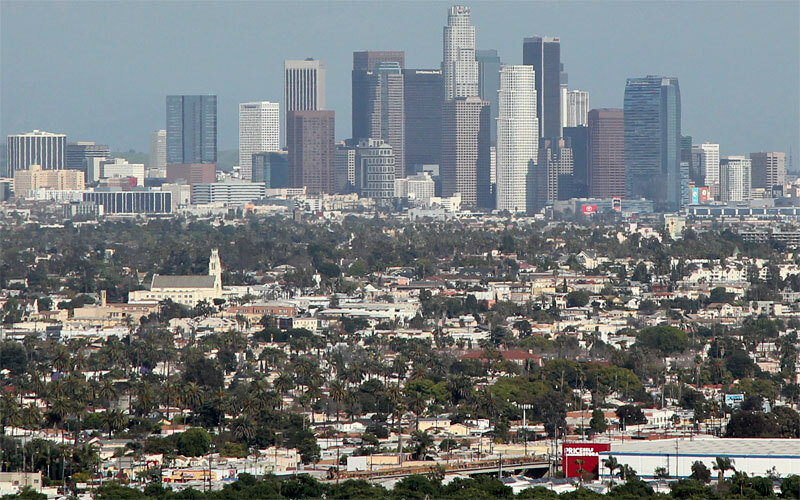 Above is the view east toward the La Brea bridge; below is west toward La Cienega. 6/16/10 —The sun is on the north side of La Brea late in a June day. 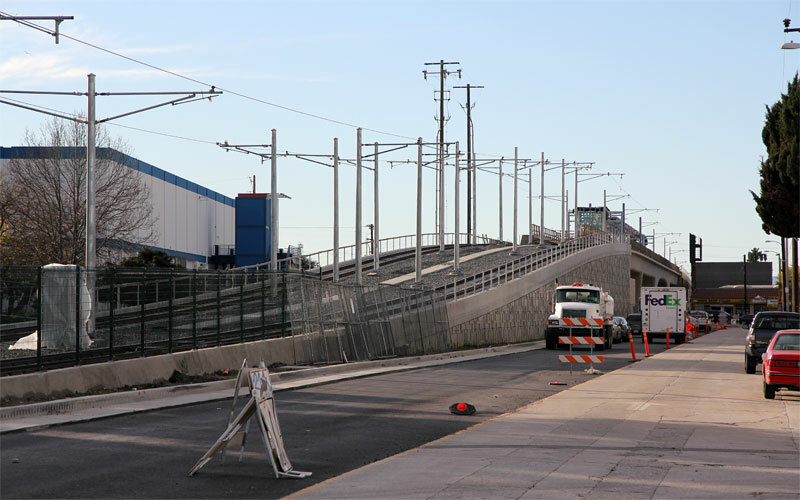 Track is finished and there are new station canopy supports. 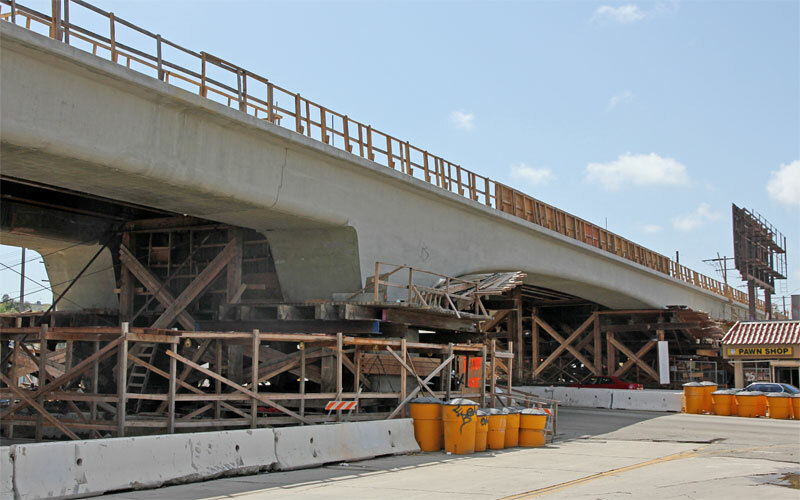 5/4/10 Ribbons of rail are stretched up the east ramp (above; also see 1600-pixel wide photo), ties are being delivered (below), and the remaining falsework is gone from the bridge (second below), showing the curved span and curved-bottom side connections between columns. Compare to the simulation at the end. 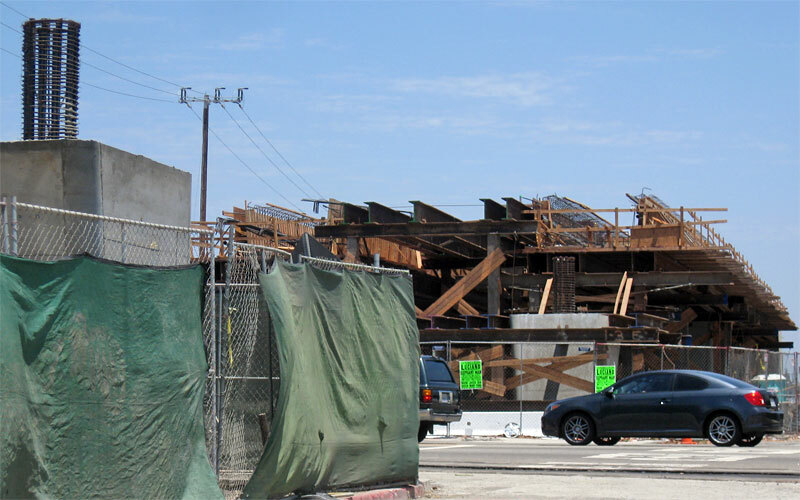 4/12/10  The falsework over La Brea has been removed  compare with the simulation below. 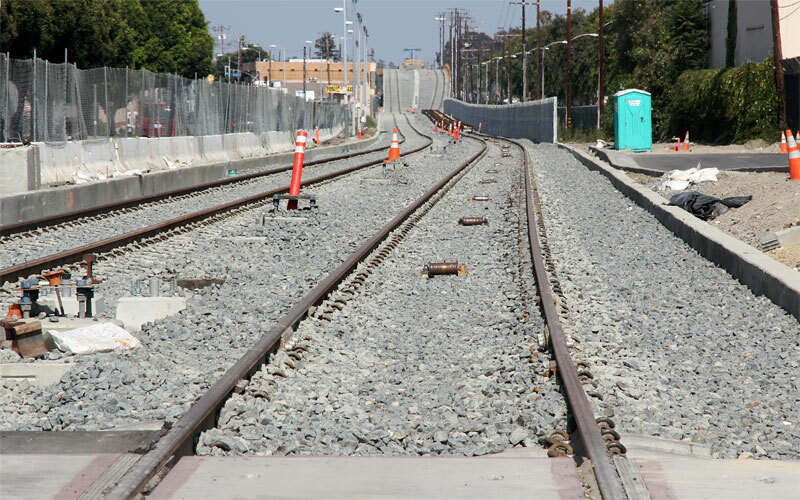 Ballast is on the east ramp (below), awaiting the first ties and rails west of Farmdale Ave.
3/10/10  The Expo Line crosses the La Brea bridge (bottom) on its way to downtown Los Angeles in this view from Baldwin Hills Scenic Overlook state park. 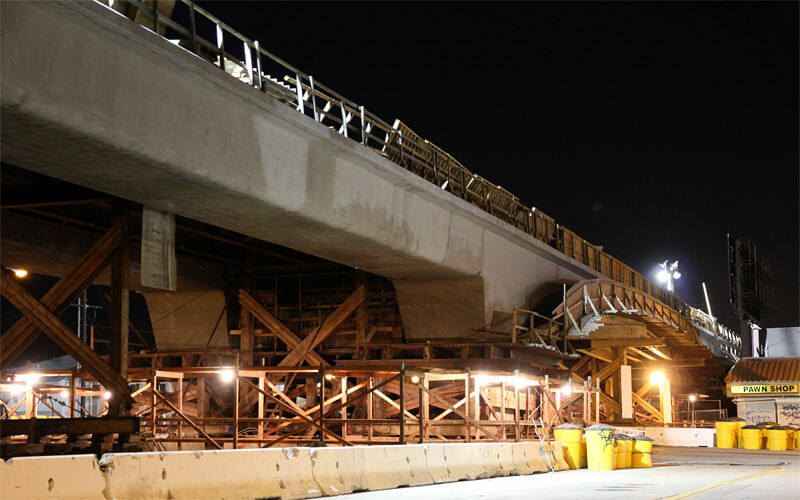 3/4/10  A night view, showing the remaining falsework and pedestrian walk below the bridge. 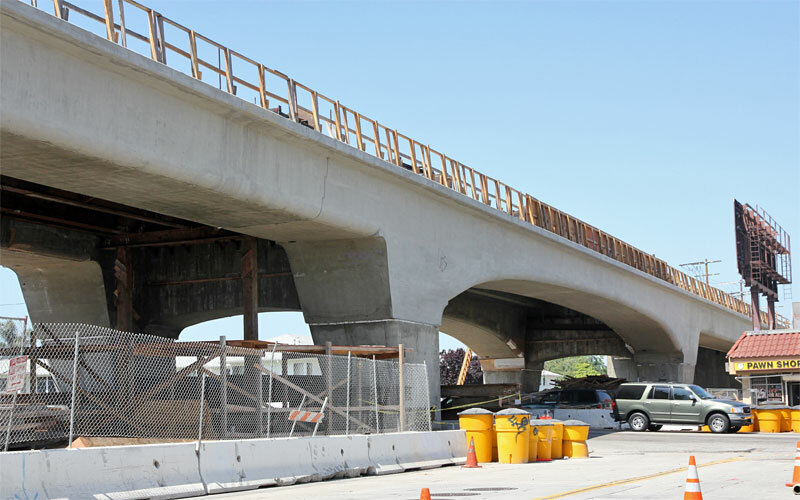 2/28/10  The falsework on the east side of La Brea was removed last week, showing more how the finished bridge will look. 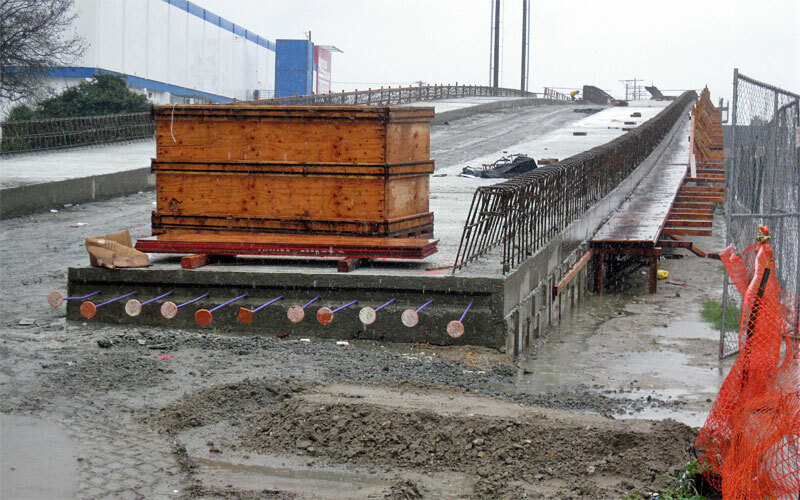 2/18/10  The bridge's concrete appears nearly finished (compare with the simulation image below). 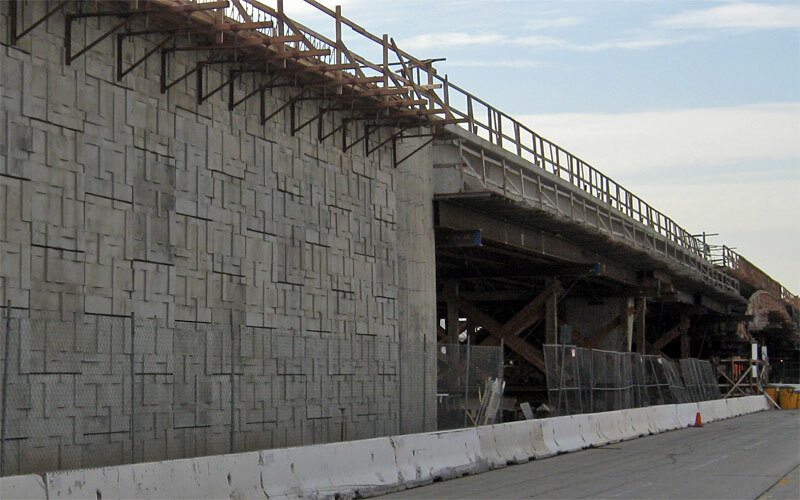 2/5/10  The track slabs are finished on the eastern La Brea ramp, with rebar for the parapet walls. 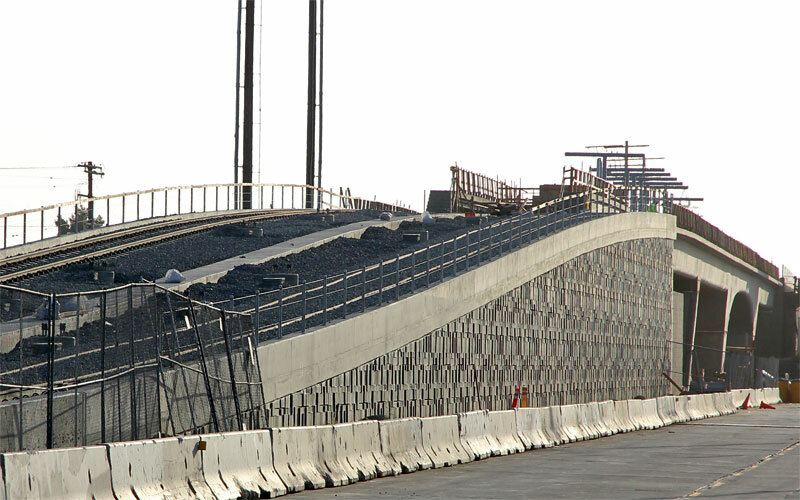 1/29/10  The retaining walls and bridge are nearly complete. 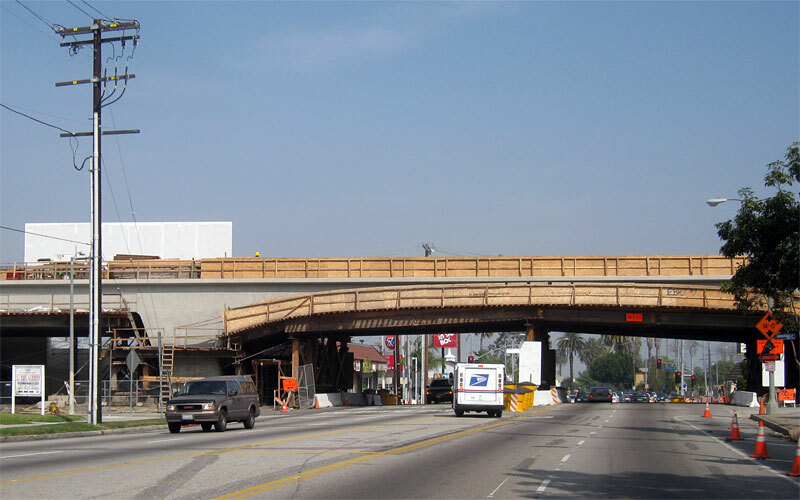 Construction is proceeding west of La Brea with soundwall poles and trackway grading, below at Cochran Ave.
11/20/09  Forms are coming along well, looking more like the bridge arch (see simulation at the bottom of this page). 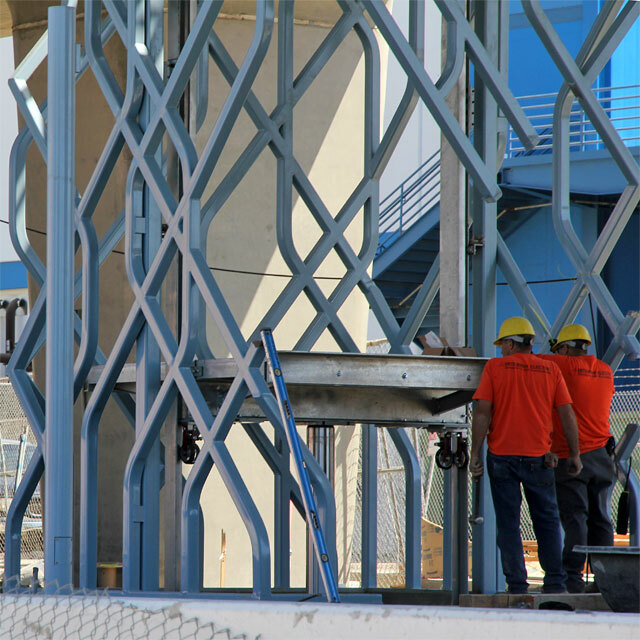 10/16/09  Construction workers posed for this detail of the west side falsework. 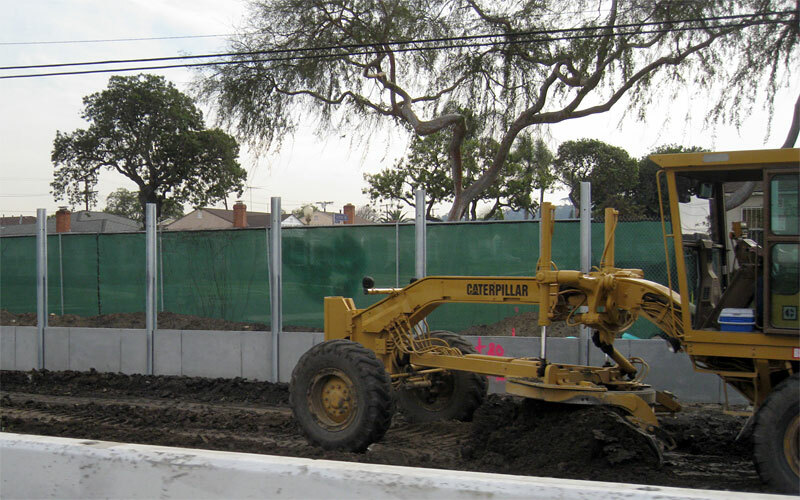 10/13/09  Here's how the MSE (Mechanically Stabilized Earth) walls are tied into the earth fill. 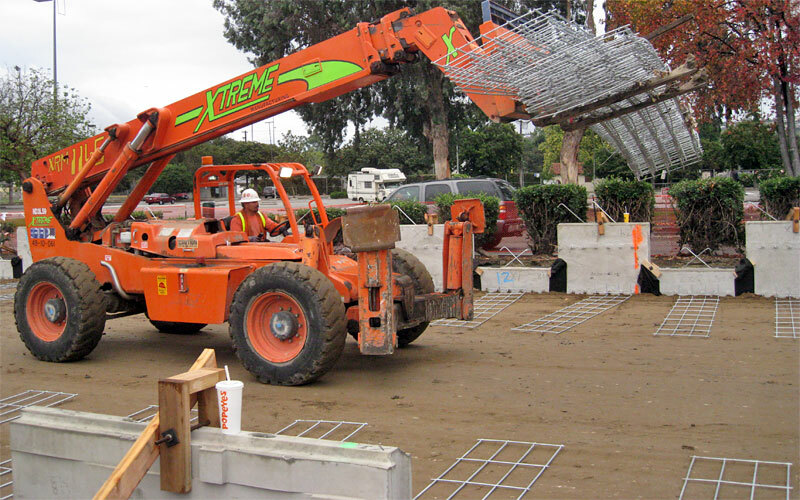 These steel grids are tied to loops on the backs of the concrete wall sections, then compacted into the earth fill. 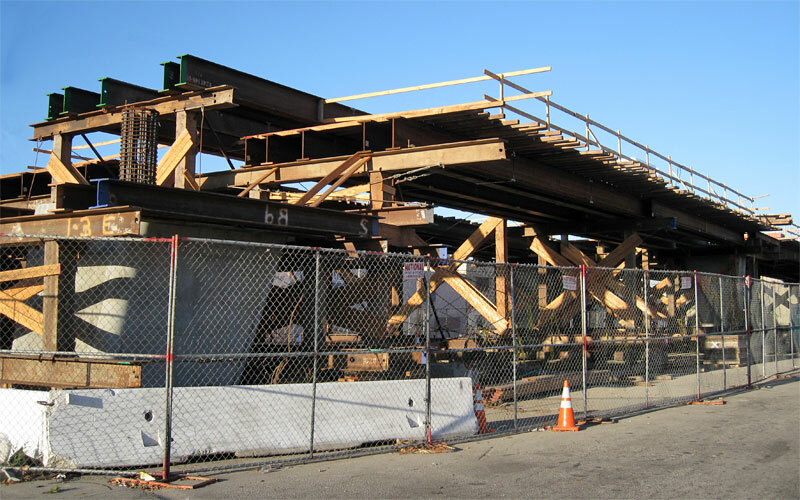 10/6/09  Falsework spans La Brea as of last night! 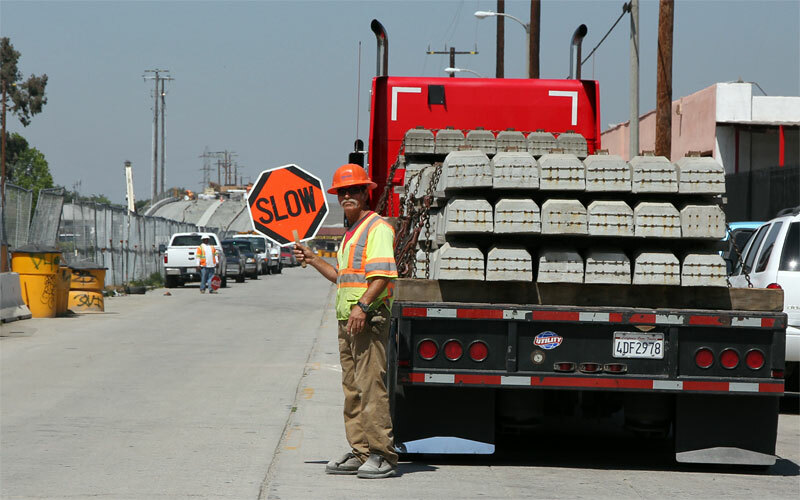 The electric sign says La Brea is closed for a number of nights from 9PM to 6AM for this construction. Note the finished concrete on the far right. You can see how the steel beams will support the forms for the shallow concrete arch, and the higher beams will form the station platform, in the simulation image second to the bottom of this page. 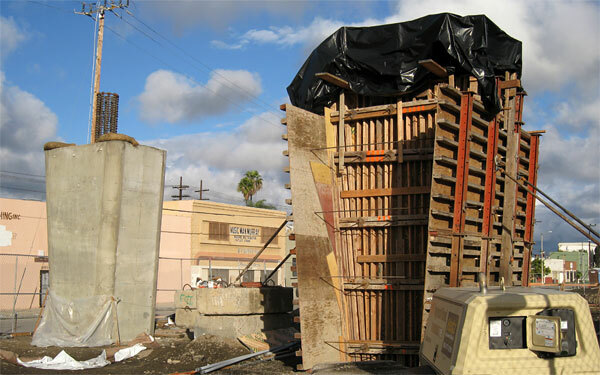 7/3/09  Above shows a completed column on the west side of La Brea and forms and rebar on the east. 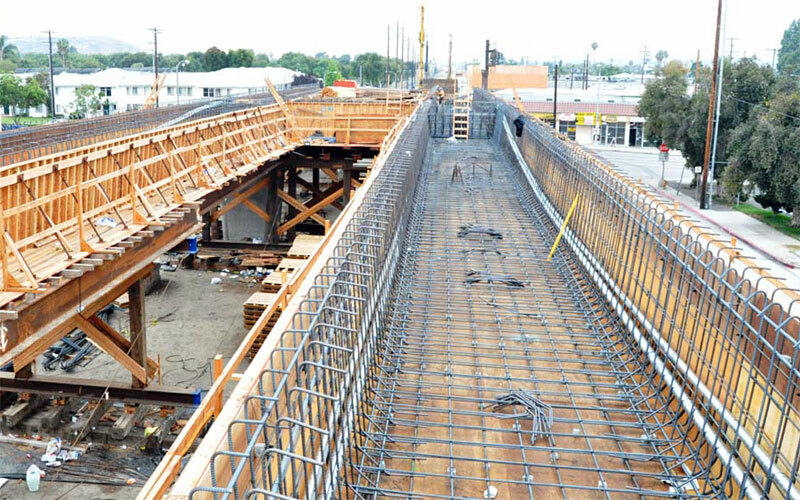 Below is a new photo of forms and rebar on the La Brea bridge (looking west) from the 7/9/09 Expo Board presentation. 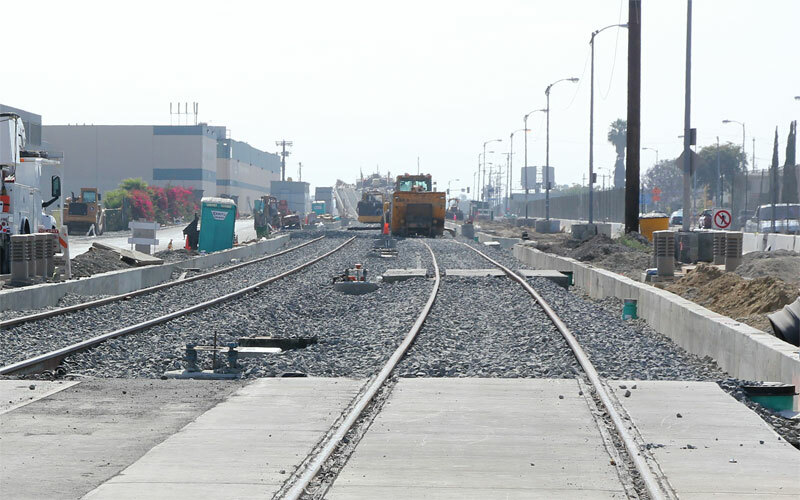 You can see where the station will be between the two tracks. 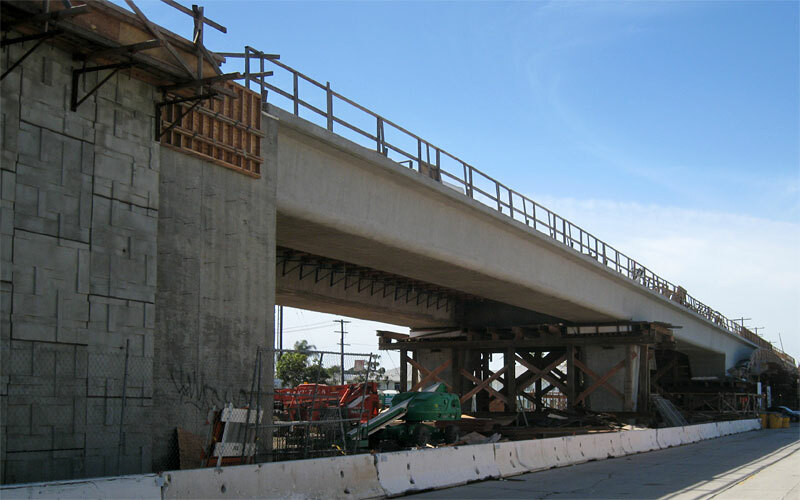 5/7/09  Falsework for the La Brea bridge and aerial station (higher center section) is taking shape. 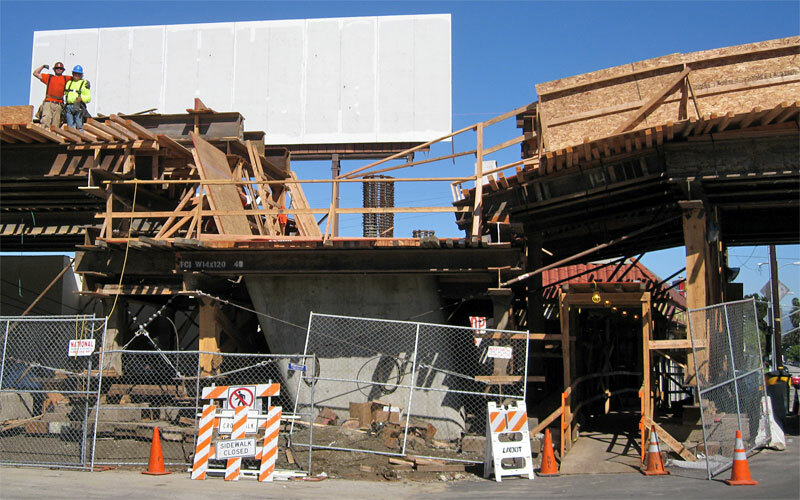 1/24/09  Above are the first two columns just east of La Brea, looking west. 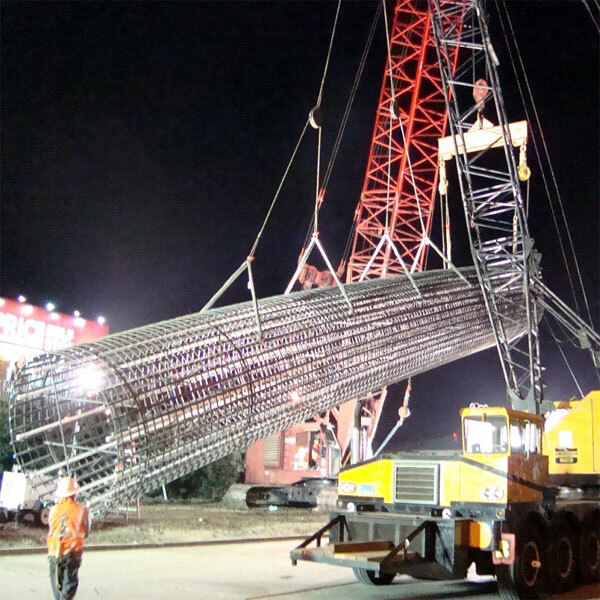 On the left is the first completed column; on the right is the footing's rebar cage extending above ground. 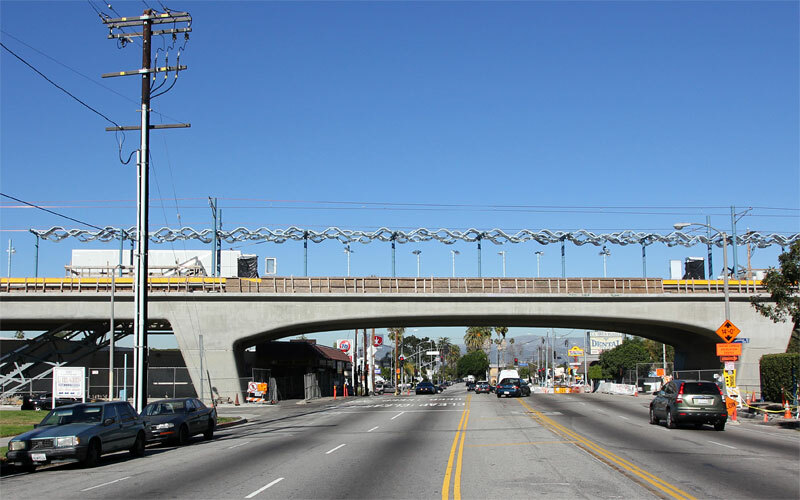 Also note the high wires on the west side of La Brea across the right-of-way are finally down. 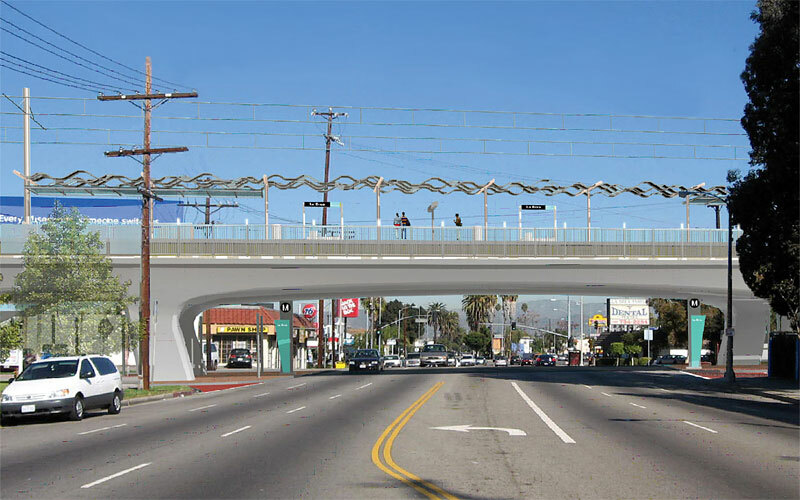 Construction on the west side of La Brea will commence after all the wires are moved. Below the two columns farther east of La Brea have been cast, with forms still on the right one (looking east). 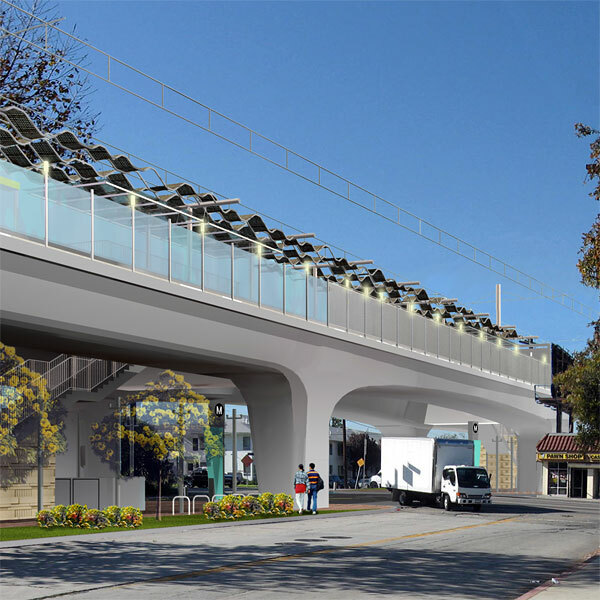 Delays on DWP undergrounding aerial power lines at La Brea and La Cienega were a major cause of the project being behind schedule. 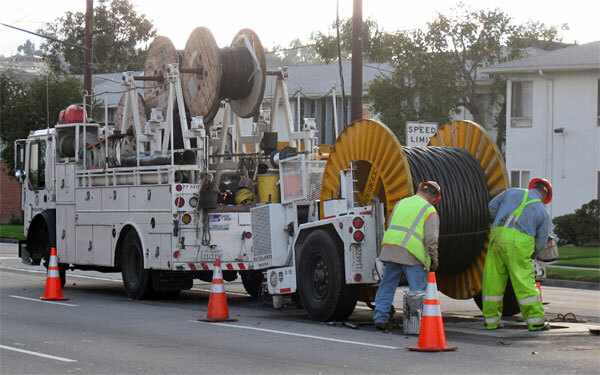 Above is a crew pulling new underground cables. 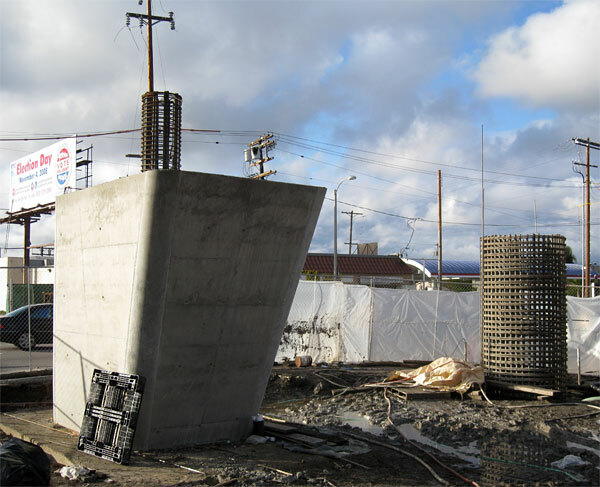 12/12/08  This shows the large number of cast-in-drilled-hole footings under what will be the east La Brea bridge abutment. Like the single columns, those go deep! The white plastic pipes are for testing: a radioactive source is lowered down the pipe, to check for voids in the concrete. 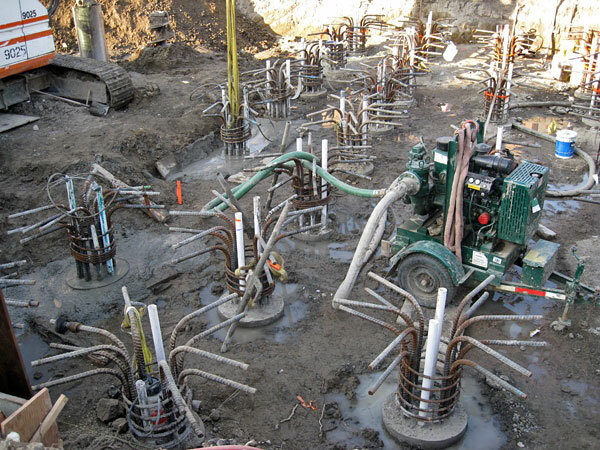 11/5/08  The hole is about 85 feet deep. The corrugated metal lining goes down the top 20 feet. The visible rebar cage is 40 feet long and overlaps the longer buried cage 20 feet. The hole is filled with a polymer liquid to keep the earth walls intact. Concrete is pumped down a pipe to the bottom. As it fills the hole the displaced polymer liquid is pumped out and filtered in the large tanks farther east on the right-of-way. 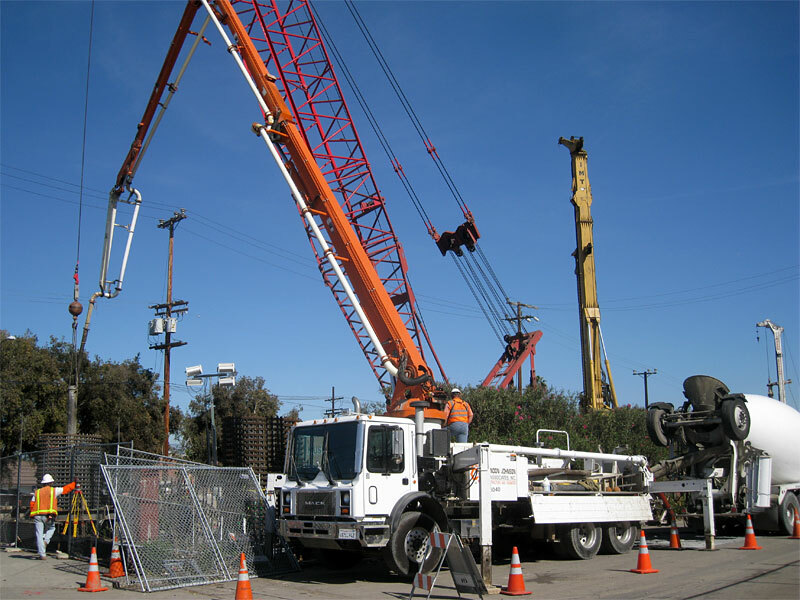 In the photo above the concrete pumper's boom hose is inserted in the vertical pipe and the first of 30-40 concrete truck loads is being pumped into the hole. 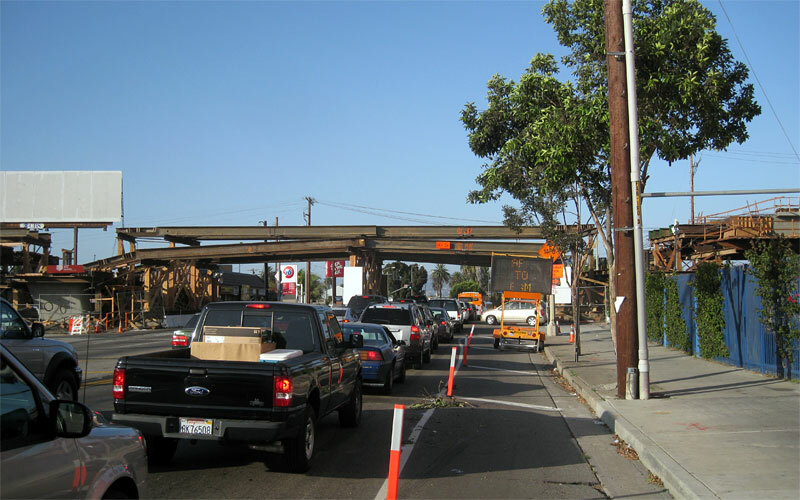 10/29/08  An 80-foot-long rebar cage is so heavy it took two cranes to lower it into the hole (Expo Authority copyrighted photo). 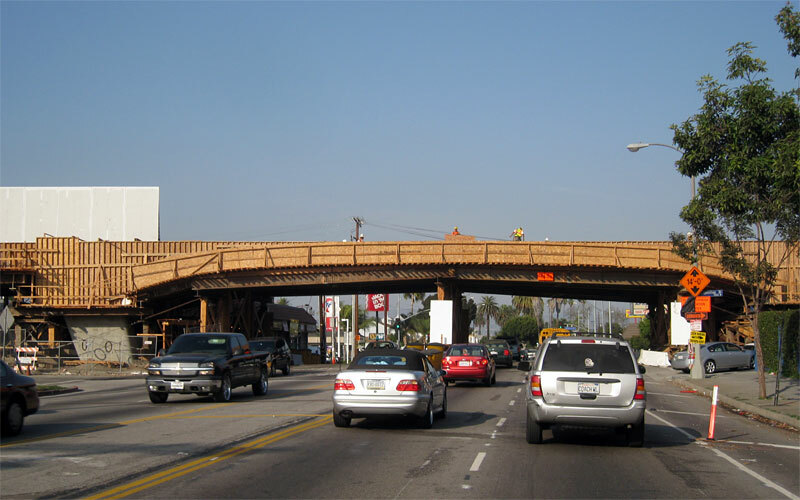 10/10/08  Bridge construction has begun at La Brea and La Cienega by drilling huge holes in the ground for column footings, filling them with steel rebar cages and concrete, and casting columns above ground. This photo above shows a hole-boring crane east of La Brea. The yellow arrow points to a corrugated steel cylinder just showing above ground, lining one of the eastern pair of column footings, covered with wooden planks. 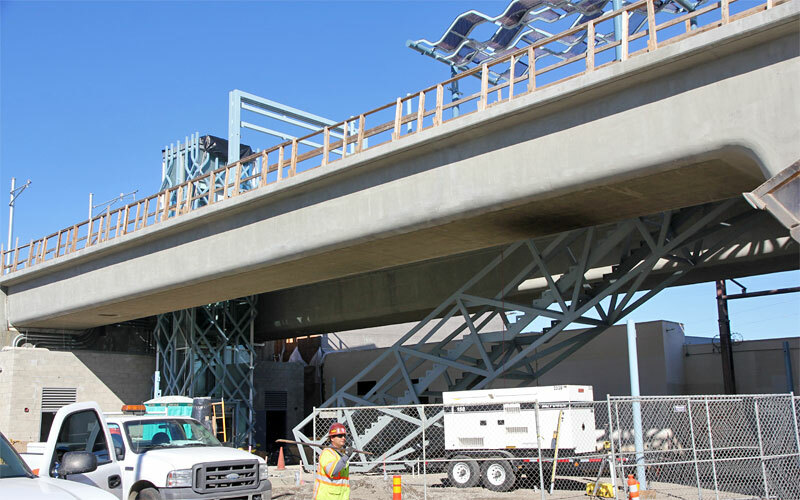 Above is an Expo Authority image of the La Brea bridge with aerial station, looking north. Below is another, looking southwest.